The Spectrem Household Outlook, a measure of the long-term confidence among investors in four financial factors which impact a household’s’ daily life, fell to 22.90, the lowest Outlook since June of 2017. There were corresponding decreases in the Outlook for Household Assets, Company Health and the Economy among all investors, and the decrease in the Outlook for the Economy among Millionaires was sizable, down to 12.70, the lowest level since November. In February, the SMICI was at 18 and the SAICI was at 12 and confidence among investors was stoked. Since then, confidence has dropped, waned or remained flat, and the July index shows little overall change from the June index. However, a look at the individual components of the index show a general disinterest in investing. The percentage of investors making new investments in stocks, bonds, mutual funds and even cash are down from June. The percentage of investors admitting they are not adding to their portfolio in July increased to 38.8 percent overall, the highest percentage since June of last year and the fifth consecutive month that percentage has either risen or stayed the same. Millionaires show a bit more enthusiasm for investing than non-Millionaires, but Millionaires investing in cash products rose to 28.6 percent, a five-month high. Among non-Millionaires, investing in Stocks fell more than five points to 22.6 percent and investing in Cash fell more than eight points to 15.3 percent. The Spectrem Household Outlook dropped by more than two points, from 24.6 to 22.9, in part to another drop in the Outlook of the Economy, which is down to 22.9 overall and down to 12.70 among Millionaires, the lowest mark since November. The summer months are historically a slow period for investing in America, but the American government continues to toy with the global economy due to tariff threats, followed by tariff removals, with constant negotiations going on between countries. At the same time, the major indicators seem to show the American economy is still thriving in its post-recession recovery, and the end result is nothing but true uncertainty. As a result, investors surveyed for the Spectrem Investor Confidence Indices display caution, and the indices show little or no movement up or down. The Spectrem Millionaire Investor Confidence Index (SMICI) improved one point to 8, but that is a far cry from the 18 it registered just six months ago. 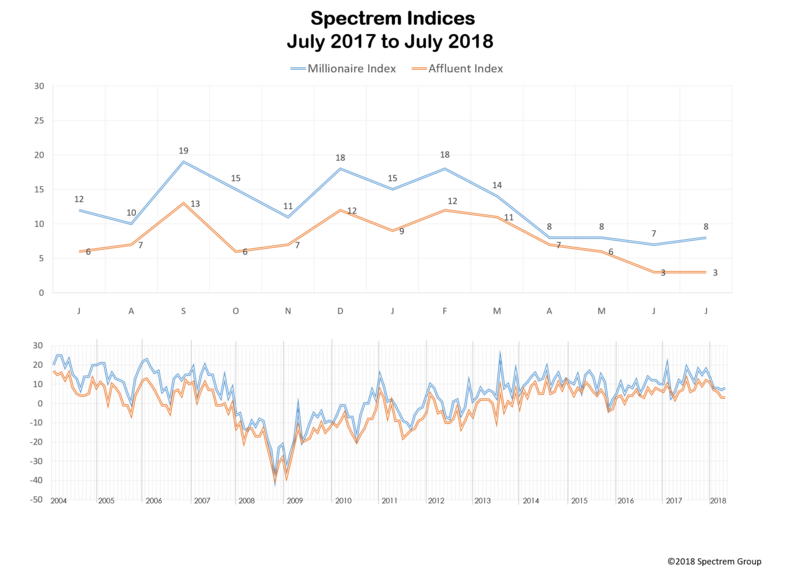 The Spectrem Affluent Investor Confidence Index (SAICI) stayed flat at 3, also well below the mark of 12 reached in February. The monthly SAICI tracks changes in investment sentiment among the 17 million households in America with more than $500,000 of investable assets. The SMICI reflects the investment sentiment of households with more than $1 million in investable assets. The July investor fielding took place between July 17 and July 24, 2018. The uncertainty in confidence levels overall is reflected in the shades of movement among specific categories in the index. Investing among all investors dropped for Stocks, Bonds and Cash and even were flat for Stock Mutual Funds. Among Millionaires, Stock Investing rose less than 1 percent, Stock Mutual Fund investing was identical to the month before, Bond and Bond Mutual Fund investing was down, and the only noticeable increase was in Cash investing, up to 28.6 percent of Millionaires. The only index segment that saw an increase among non-Millionaires was for Individual Bonds, but that rose to just 5.7 percent of investors. The Confidence Index also identifies those investors who have no plans to increase investing in the coming months, and both Millionaires and non-Millionaires were steady in that category, 30.2 percent and 47.6 percent, respectively.